Listed below are our members that provide accommodations of varying types. All of our members are licensed lodging facilities, which assures you that they meet state and local standards for health and safety. For a complete list of all Florida Keys licensed lodging facilities, click on www.fla-keys.com. Anchorage Resort & Yacht Club, Inc.
All rooms can accomadate up to 4 adults, they have four burner cooktops, microwaves, full size refrigerator/freezer, queen size bed in bedroom and queen sleeper sofa. All units have screened in balconys overlooking the Florida Bay. Tropically located directly on a beautiful stretch of Florida Bay, we offer a quaint sandy beach, heated pool and newly renovated guest rooms. Enjoy stunning sunsets from our private beach and jetties. Nestled in a coconut grove with 400 feet of white sand beach on Florida Bay, our Inn is the Key's most unique beachfront hideaway. Heated pool, 2-200 foot private docks, tikis, BBQ's, cont. breakfast, boat ramp, paddleboats & kayaks. This modern hotel is 1 mile from the Dolphin Plus swim facility, 8 miles from John Pennekamp Coral Reef State Park. Contemporary rooms have desks,flat-screen TVs, minifridges, coffeemakers, free WiFi, kids 19 and under stay free w/adult. Enjoy the Keys in quaint cottages submerged in a tropical setting. Relax in the sun or under a tiki hut. Swim,fish or snorkel from our sandy beach and dock. Friendly service helps make your vacation a memorable one. Join us for amazing sunsets. Barely a one hour drive from Miami International Airport. We feature 153 luxurious guestrooms and suites, on 17 acres, with spectacular sunsets over the Gulf. Amara Cay Resort is anchored in the laid-back style and carefree atmosphere that makes Islamorada the Sport Fishing Capital of the World. Reflecting the easy tranquility of the Upper Keys,Amara Cay Resort seamlessly blends recreation with relaxation. Our resort has 65 completely remodeled spacious units! Oceanfront guestrooms & suites have spectacular views of the Atlantic Ocean. Individually appointed villas w/ fully equipped kitchens range from single room efficiencies to 1 & 2 bedroom units. A unique oceanfront hideaway with 18 1&2 bedroom suites, most with balconies. Professionally decorated to reflect true island style. Unlike any place in the Keys! An affordable, clean, quiet and relaxing hideaway located directly on the Atlantic Ocean within walking distance to many popular Islamorada hot spots. Enjoy the oceanfront pool, rooms and cottages with kitchens and boat ramp. You will find the perfect island getaway – just an hour drive from Florida’s mainland. Lounge oceanfront on our beach, at 1 of our 2 pools or Tiki Bar. The Caribbean feel of a traditional beach resort w/ the amenities of a luxury hotel. Very Clean, centrally located in Islamorada. Motel rooms and efficiencies at $39 Sun-Thurs in off season. Fri/Sat rates starting at $50. Beautiful sunsets, music, bars and dinning within walking distance. Located on MM 82.2 in the "heart" of Islamorada. Informal, relaxing and unforgettable, here is the best place to put away your watch and let the tide keep the time. Postcard Inn has it all - guest rooms, suites, white sandy beaches, 5 restaurants/bars, Home of Famous Tiki Bar & Shula's 2, deep sea fishing charters, boat rentals, water sports, diving, snorkeling, jetpak rides, chic boathouses, & beach weddings! This oceanfront retreat conveys barefoot elegance and Old World charm. Once a coconut plantation, the Moorings houses 18 1,2 and 3 bedroom cottages on 18 acres featuring a beautiful natural white sand beach. Banana Bay Resort and Marina is situated on 10 spacious acres, but only has 59 deluxe guestrooms. The hotel offers all the amenities of a grand style resort, but is more like a tropical inn that is quiet, intimate and romantic! Hyatt Place Marathon is situated gulf side at the site of the historic Faro Blanco Lighthouse and famous Seven Mile Bridge.Complimented by full-service 72 slip marina club,the three level hotel,with 125 guestrooms is right next to the Gulf of Mexico. Accessible only by boat or seaplane, the resort is a world unto itself! Paths wind through lush gardens to thatched-roof bungalows. Each suite has romantic touches i.e. a king-size bed, verandahs w/ ocean views & in some, outdoor showers & tubs. A LGBT guesthouse for Gays,Lesbians and Friends of Our Community setting a standard for comfort and style,Alexander’s delights with lush gardens,historic charm with contemporary accents throughout,created in the spirit of wellness, ease and comfort. Quality accommodations, in the heart of old town located on Truman Ave., 1/2 block from Duval, at an affordable price. Close to beach, nightlife and attractions. 24/7 ONLINE RESERVATIONS AVAILABLE OR CALL 1-800-311-4292. In the heart of the Southernmost City, Ambrosia is just steps away from the Duval St, Mallory Square & the Historic Seaport.Our bed & breakfast is within walking distance to most of the island's attractions, museums, beaches & water sport activities. Located on the quieter end of Key West's famous Duval St, the Avalon Bed and Breakfast is a beautifully restored Colonial c1885.Offering romantically appointed rooms featuring private bathrooms, mini refrigerators,flat screen TV's & canopy net beds. Where tri-level, downpour blue decks surround a shimmering swimming pool. An adult only Key West Bed and Breakfast with a serene, spa-like atmosphere. Your personal, southernmost sanctuary. The perfect romantic getaway. The Banyan Resort invites you into a world full of lush & fragrant gardens situated on a tranquil Caribbean Estate in the heart of Old Town Key West; ideal location for your visit, 2 blocks from world famous Duval St! Florida Certified Green Lodge. An oceanfront, seven acre tropical oasis. A heated pool overlooking the Atlantic Ocean. The Cheekie hut provides local food and cocktails. 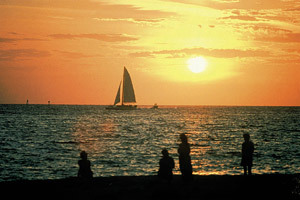 Explore historical Old Town Key West and see the famous Sunset Celebration, only a few minutes away. Cabana Inn is a historic conch estate that has been converted into a comfortable Inn.You will discover magnificent palms,lush courtyards,an inviting lagoon pool,in-ground Jacuzzi,a large sun yard w/treetop walkways overlooking a lush tropical garden. Casa 325 is your home away from home on Key West’s Duval St. Every one of our rooms and suites is unique and offers its own special Key West experience. The historic Casa Marina Resort, located on the Atlantic Ocean, has the largest private beach in Key West. Offering 311 guestrooms including 71 suites & 11, 000 sq. ft. of meeting space. Perfect for any meeting or incentive program. Oftentimes in life the need for some major R&R ceases to be a luxury & becomes a necessity. For your most urgent rest & relaxation requirements, we offer a most luxurious solution - a tropical resort on the Atlantic Ocean, called Coconut Beach. The Conch Republic Cottage Suites offer affordable vacation rental suites and bungalows that are just steps from Duval Street and the best beach in Key West. Historic Cottages & Inns, 1-1/2 blocks from Duval St., 7 blocks ocean to ocean, walking distance to attractions, continental breakfast, heated pool, beach club membership, private baths, parking, pets welcome, and Great rates. The Waterfront Courtyard features the Courtyard Cafe, serving breakfast daily; a heated outdoor pool and spa; poolside Tiki Bar, serving lunch and your favorite beverages; fitness room; meeting room; waterfront rooms; and a private sunbathing beach. La Concha, tallest building on the island, still echoes the grandeur of days past, & is in the center of Key West on Duval Street. Eat Dinner at Jack's Seafood Shack or watch the sunset w/ the only 360 degree panoramic view. Voted best sunset view! Beautiful Victorian mansion, perfect location, steps to Duval & Mallory Square. Your stay includes a full breakfast w/ made to order omelets & an open bar cocktail party. Rooms comfortably appointed with private bath and AC. Free parking & wireless. The Douglas House is your ticket to Paradise, offering the finest accommodations and the best location. Located in the centre of Old Town Key West, the Douglas House is literally footsteps away from world class Duval Street. Duval Gardens boasts charming, intimate accommodations, located in the heart of Old Town on Key West's famous Duval Street. Guest rooms possess tropical ambiance, with queen & king beds, AC, flat screen TV, refrigerators, private bathroom. The Fairfield Inn is one of the newest hotels in Key West Florida. Opened in 2015, this newly built, contemporary hotel is located at the entry point of Key West & is convenient to all of the island's best attractions via hotel shuttle. 132 Affordable rooms and suites. Suites with coffee makers, microwaves and mini fridges. Continental Breakfast included. 2 Heated pools. Warmth & charm abound at this historic Inn, located in Old Town, a tropical canopy, with romantic porch seating areas, complimentary beach passes, personalized service and expanded continental breakfast. Relax & Recharge in Key West Style Located in the heart of Old Town, A Frommer's Guidebook 'Find,' winner of the Superior Small Lodgings 'White Glove' award for excellence in cleanliness, and featured in National Geographic Traveller. Experience Key West luxury redefined. Relax in your residence inspired suite featuring a balcony or private patio with plunge pool. Venture upstairs to enjoy the sweeping views at our rooftop pool and bar. Discover a chic adult only oasis. This newly built hotel opened in April 2016 and is set at the entry point of Key West. Convenient via onsite hotel shuttle to all of the islands best attractions such as Old Town, Duval Street, Mallory Square, Smathers Beach and the Hemingway House. An exceptional collection of vacation rentals. Selections include historic homes, lovely townhomes, cozy cottages and condos. Weekly-monthly-seasonal. Our newly revitalized Hyatt Key West resort is the ideal location for exploring the sites of Old Town, while still staying within a private retreat. Allow our comfortably restyled resort to treat you to a new level of relaxation. Island City House Hotel is comprised of three unique houses that share tropical gardens and brick pathways winding throughout. We offer complimentary breakfast, a heated pool and children under 12 stay free. Conveniently located to attractions. Historic Key West Inn with distinctive local architecture. AAA 3 diamond rating. Perfect location in the center of Old Town. Walk to all Key West attractions. Free parking. Large pool. Continental breakfast included. All rooms smoke-free. Features include 5-star amenities and service, luxury accommodations, and world-class dining on a lush seven acre waterfront property. Amenities include free internet, Blue Bar, concierge service, fitness center, all only minutes from Duval Street. Key West's only oceanfront B & B in historic Old Town. These two sister properties are restored Victorians with elegant guest rooms overlooking tropical gardens and sandy beach. Deluxe continental breakfast and afternoon tea served poolside. We want each of our guests to come away feeling that same magic we felt ourselves the first time we came to Key West.Our collection of 5-star meticulously furnished homes, condos & villas include 24/7 concierge guest services.Daily,Weekly & Monthly. AAA Four-Diamond Full-Service Resort! Located in the heart of "Old Town" Key West and one block from Duval Street's famous watering holes, museums, and shopping. Join us on our pier for our nightly Sunset Celebration. Luxurious small inn. Two pools, marble baths, private porches, Cafe Marquesa, free parking. Located one block from Duval Street. Rated #1 Key West Hotel by Zagat's Reader Survey, and 4-Diamond Award for 13 years. 1-800-869-4631 for rates. Step into Marrero's Guest Mansion and step back in time to a more relaxed era. Relax and sip a glass of wine on our beautiful porch located steps from Duval Street. Ocean Key Resort, located in Old Town, between Mallory Square & Key West Harbor, just steps from attractions. 100 luxurious guestrooms and 1 & 2 bdrm suites, all with a view of historic Duval Street or the Gulf Of Mexico. Located just steps off of Duval St in the heart of Old Town, Old Town Manor offers a huge continental breakfast, beautiful historic gardens to host weddings, and a quaint atmosphere. Very few can compare to its classical setting. Discover the luxuries of Orchid Key...Four Star service & amenities, 24 Luxurious rooms & suites, free wi-fi, complimentary breakfast & happy hour. Resort style pool, spa & sundeck, and off street parking. Located right on Duval! Minutes from historic Old Town, our resort is located on the Florida Bay complete w/beautiful sunsets. Parrot Key is close to all the activities you would want to enjoy during your stay, dining,shopping,historic attractions,beaches, & entertainment. Key West's premier resort, Pier House is located on the water at foot of Duval Street. The resort features 142 rooms, private beach, 3 restaurants and 4 bars, full service spa, live entertainment, tropical gardens and professional meeting services. In Old Town, Rose Lane Villas is easy to find but difficult to leave. It's close to the action as you'll get without sacrificing a good night's sleep. Each of the Villas is perfectly laid out for your family gathering, reunion,or destination wedding. New Luxury 2BR 2BA Suites in Old Town Key West. Steps to the ocean and Duval Street. ALL of the amenities you expect and desire. Relaxation, comfort, and stylish appointments to make this private resort a place to entertain or to get away. An all-suite resort among Key West's deluxe hotels, is an oasis in paradise! Amenities include: Concierge Desk, Fitness Facility, Beaches Nearby, Bicycle Rental, Bar, Room Service, Outdoor Heated Pools, Jacuzzi, Gift Shop, Pet friendly & more! This new Old Town boutique hotel just blocks from Duval Street welcomes you with island inspired charm, inviting deals, and rates to suit your budget. This popular hotel is on famous Duval Street in Old Town. Walk to shops, dining, galleries & beach. Deluxe guest rooms include safe, hair dryer, iron & board, coffee maker. Resort amenities include 2 pools, Jacuzzi, 2 poolside bars and concierge. The Southernmost on the Beach is nestled on the Atlantic amidst swaying palms and a white sandy beach. Stroll to restaurants, attractions, and Key West's dazzling nightlife. A tropical oasis nestled in the heart of the Casa Marina area blocks from the beach and a 7 minute walk to Duval Street. Suites include private entrance, living rooms, kitchens or kitchenettes, comfortable king and/or queen beds. Luxury island resort located 10 minutes by launch from historic Old Town. Elegantly appointed cottages w/ fully equipped kitchen,living & dining areas. Superior services & amenities. 24-hr launch transportation to The Westin Key West Resort & Marina. Charming and romantic accommodations are available in either traditional antique or a tropical poolside cottage. On your next vacation enjoy all that's best in Key West, The Conch House. The Galleon Resort is located on the Gulf of Mexico just off Duval St. and only 3 blocks from Mallory Square. The resort has 1-3 bedroom condos as well as efficiencies. The Galleon amenities include pool,jacuzzi,sauna,Tiki Bar and private beach. The Gardens Hotel is a beautiful tropical oasis set within the walls of the famous Peggy Mills garden. Our 17 luxury rooms and suites with the finest amenities make The Gardens a true island paradise. This boutique hotel offers an intimate setting that invites you to celebrate a colorful history & creative spirit.Mixing contemporary design and retro Floridian,guestrooms have modern amenities that combine sophistication & the island’s casual vibe. Relax & Recharge in Key West Style in Old Town 5 blocks from the world famous Duval Street.A Frommer's Guidebook 'Find,winner of the Superior Small Lodgings 'White Glove' award for excellence in cleanliness,& featured in National Geographic Traveler. Enjoy luxurious rooms & world-class amenities! All rooms have been upgraded & renovated. From flat screen tvs to the tropical splendor of the largest pool in Key West, every detail has been thought of to make your stay a true escape from reality! Located across from the breathtaking Florida Bay at the southernmost tip of US! 1BR suites, bi-level 2 & 3 BR penthouse suites, & standard rooms w/ queen bed. Heated outdoor pool, Jacuzzi, complimentary continental breakfast. Free wireless internet! In Old Town, our accommodations range from the intimate tropical feel of the Conch Cottage to the elegant Caribbean Queen Suite with it's four poster bed, wraparound veranda and Roman soaking tub. Enjoy a relaxed vacation in a true Key West mansion. The Perry Hotel is breathing new life into Stock Island. But it’s more than a boatyard transformed into a beautiful boutique hotel. You’re not just staying somewhere, you’re part of something more. Renovations are complete on Key West’s premier luxury resort. All rooms have been redesigned and remodeled, as well as the new boutique-style lobby and pool. Check the official site for all the details of this stunning transformation. In your quality Florida B&B,you’ll find attentive service & distinctive style,infused w/character & devoid of pretension.Where “laissez-faire” meets “Zen” in a lush secret garden enclave that relaxes your mind,engages your senses,& soothes your soul. Villas Key West consists of renovated 1 & 2 bedroom villas & suites located just a ½ block from Duval Street, available for nightly, weekly & monthly stays. Enjoy relaxing days at the pool and the exciting night life. Each villa has a full kitchen. The Weatherstation Inn maintains the integrity of traditional Key West style. Bahama shutters, gleaming hardwood floors and furnishings bring to mind the plantation homes of the British and Dutch West Indies. An enchanting, tranquil compound in the heart of Old Town's historic seaport district just 2 blocks from the waterfront and 4 blocks from Duval Street. Enjoy our gardens,pools (1 heated in winter),architecture and complimentary continental breakfast. We invite you to stay in Key West's premier family owned inn ideally located on fabulous Duval Street. The atmosphere is relaxed and with six restored homes, we offer a large variety of accommodations. A poolside breakfast and parking are included.